It’s that time of year again! The snow is melting (albeit more slowly than I’d like), the birds are starting to sing again, and the days are getting longer. All of these signs also mean that it’s time for spring cleaning! 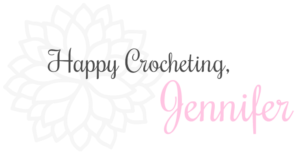 Time to clean up and organize the clutter that’s accumulated during the long winter months. 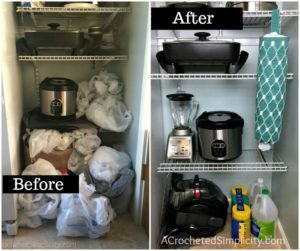 There’s one particular space that I’m constantly having to de-clutter… the pantry. 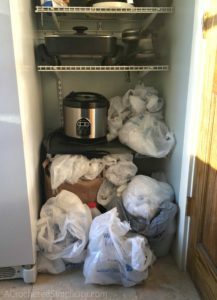 More specifically, the mountains of plastic grocery bags that seem to multiply on their own. 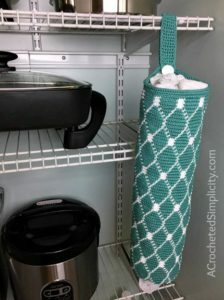 The Moroccan Grocery Bag Holder is the perfect crochet solution! Alternate Uses: If you don’t use plastic grocery bags, this bag will also make a great bag to organize cleaning cloths. I cut up old towels and t-shirts and use them as cleaning cloths. This would make a great bag to keep the piles under control. I chose Lion Brand 24/7 Cotton, a 100% mercerized cotton, for this design. The mercerization process gives the yarn an incredible sheen and stitch definition (perfect for tapestry crochet). It is available in 24 wonderful colors that include brights (perfect for summer fun!) and neutrals (perfect for everyday). This yarn is great for a variety of projects ranging from various home decor items to accessories. It is classified as a worsted/4 weight yarn, but I feel it’s on the lighter side of a worsted / 4. 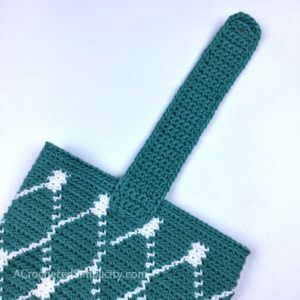 This pattern is part of the 2019 Spring Cleaning Blog Hop Crochet Along! 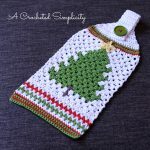 Once again, A Crocheted Simplicity, Blackstone Designs, Sincerely Pam, and Crystalized Designs have teamed up to bring you a fun blog hop style CAL. Each blogger has designed a brand new Spring Cleaning themed pattern that will help you tidy up your home this spring! 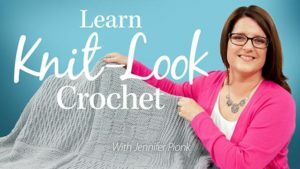 While each pattern will be a free crochet pattern on our blogs, you will need to join each designer’s Facebook Community Group in order to participate and enter to win prizes from the group. This CAL runs from April 8th-26th. 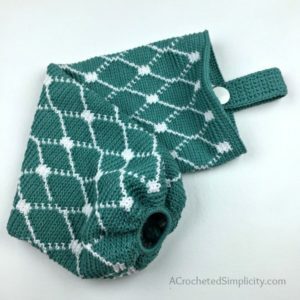 When you finish each pattern, you will post a photo of your finished item in that designer’s Facebook group to enter to win a pattern from that designer. 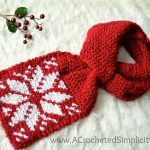 You can also upload a photo of your finished item to Ravelry projects (click HERE for a tutorial) and be entered to win a $25 Gift Card to Amazon! The more projects you complete, the greater your chances of winning! Don’t forget to tag your WIPs and finished projects on social media using #SpringCleanCAL so we can see what you’re working on! Ready to get started? 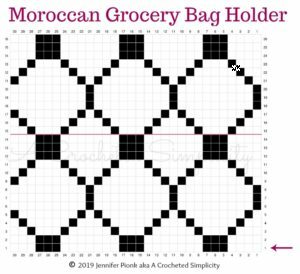 Keep reading to make my Moroccan Grocery Bag Holder! You can find the date to the next designer’s pattern at the end (link will be activated on their date)! Yarn Notes: Lion Brand Yarn 24/7 Cotton in White & Jade were used for the sample. (3.5oz / 100 g / 186 yards / 170 meters / 100% mercerized cotton). Another comparable worsted weight cotton yarn may be substituted. Note: The bag holder is worked in a spiral (continuous rounds). Do not join at the end of each round, instead use a scrap piece of yarn or a stitch marker to keep track of the beginning of each round. Move the scrap of yarn up as you complete each round. Colorwork begins in round 5. Follow the chart provided below to work the color changes. Read the color chart from right to left. Click HERE for a color change tutorial. Note: Because this design is worked in a spiral (continuous rounds), the first and last stitches of each round will be offset a tad. 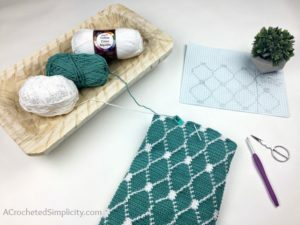 As long as you work the correct number of stitches, the design will work out correctly. Rnds 5 – 78: BLO Sc in each st around. (90 sts) Follow the color chart below. Work rounds 1 – 14, then work & repeat rounds 15 – 26 until your bag reaches a total of 78 rounds. Rnd 81 (MC): Sl st in each st around. Use the Special Join Technique to finish the round. (90 sts) Click HERE for tutorial. Fasten off. Weave in ends. Continue on to Bag Hanger. Rows 2 – 40: Ch 1, sc in each st across. Turn. (5 sts) *Note: You can work more or fewer repeat rows for a longer or shorter bag hanger. Do not fasten off. Continue on to Bag Hanger Edging. Tip! When working into the sides of the rows along the long edges of the hanger, if it starts to become wavy, go down a hook size for the edging. Fasten off. Weave in ends. Approximate Size: 1.5″ W x 8.5″ L. Continue on to Assembly. Photo Above: Position your button on the inside of the bag holder, nearest the join, with the top edge of the button approximately 1/4″ down from the top edge of the bag holder. Using a needle and thread, sew the button on to the bag holder. Position the Bag Hanger on the outside of the bag, directly behind the button. Make sure not to use the buttonhole end of the bag hanger. Photo B: Turn the bag holder over. Position the edge of the bag hanger approximately 1″ from the top edge of the bag holder. 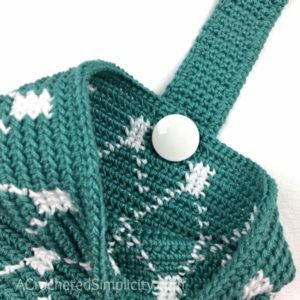 Using a yarn needle and yarn, sew the hanger onto the bag. I stitched in a square to secure it on four sides. Photo C: This photo shows the bag turned over and the button through the buttonhole. 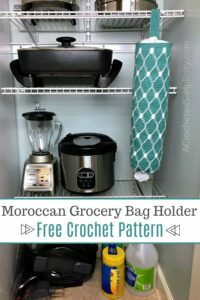 Your Moroccan Grocery Bag Holder is now ready to be stuffed with all of those plastic grocery bags you have piling up! 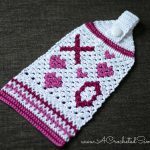 If you enjoy crochet colorwork, you may enjoy these other projects as well. 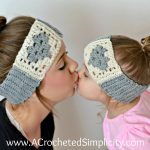 And if you just want to browse, you can find all of our free crochet patterns HERE. 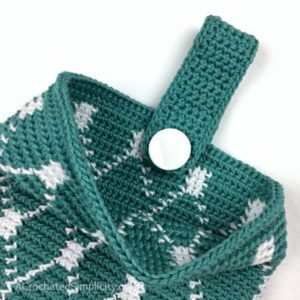 Don’t forget to join the A Crocheted Simplicity Crochet Community group to share your finished Moroccan Grocery Bag Holder and enter to win prizes! You can enter to win now through Monday, April 22nd. Every finished project is a new entry!! Love this Jennifer! Can’t join the CAL as i don’t facebook, but will enjoy the pattern. Now, that said, can we discuss reusable grocery bags? 😉 Won’t eliminate the problem, but will lessen the affect on the environment. Love the look of the bag and I’m desperately trying to think what I could use it for. Plastic grocery bags have been banned in most states here in Australia and I’ve been using the same calico bags for the last 20 years although they are looking a bit worn out now. I save old towels and cut them into smaller sizes to use as cleaning cloths. This would be perfect for them too!